Ahmadi, R., Khodadadi Darban, A. (2013). Modeling and Optimization of Nano-bubble Generation Process Using Response Surface Methodology. International Journal of Nanoscience and Nanotechnology, 9(3), 151-162. R. Ahmadi; A. Khodadadi Darban. "Modeling and Optimization of Nano-bubble Generation Process Using Response Surface Methodology". International Journal of Nanoscience and Nanotechnology, 9, 3, 2013, 151-162. Ahmadi, R., Khodadadi Darban, A. (2013). 'Modeling and Optimization of Nano-bubble Generation Process Using Response Surface Methodology', International Journal of Nanoscience and Nanotechnology, 9(3), pp. 151-162. Ahmadi, R., Khodadadi Darban, A. Modeling and Optimization of Nano-bubble Generation Process Using Response Surface Methodology. 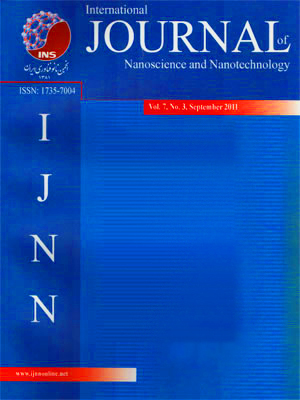 International Journal of Nanoscience and Nanotechnology, 2013; 9(3): 151-162. In this paper, size distribution of nano-bubbles was measured by the reliable and fast method of laser diffraction technique. Nano-bubbles were produced using a nano-bubble generator designed and made based on hydrodynamic cavitation phenomenon in Venturi tubes. A Central Composite Design with Response Surface Methodology was used to conduct a five factor, five level factorial experimental design on the main process variables including frother concentration, solution temperature, pH, air flow rate and pressure drop in the cavitation tube nozzle. The statistical analysis used to develop a model for predicting the median size of nanobubbles (D50) showed that the frother concentration, solution temperature and air flow rate have the highest effect on the size of nanobubbles. Results demonstrated that with increasing the frother concentration and the air flow rate, the median nanobubble size (D50) decreased. The results also indicated that an addition of 20~ 40°C temperature, increased the median size of the nanobubbles formed in the solution. In the optimum condition, the frother concentration, solution temperature and air flow rate were found to be 69.5 mg/h-1, 20°C and 0.3 Lmin-1, respectively. In this study, the minimum median size of the nanobubbles produced in the laboratory and predicted by the prediction model was 130.75 and 129.83 nm,respectively, which showed that the model results properly fitted with experimental results.